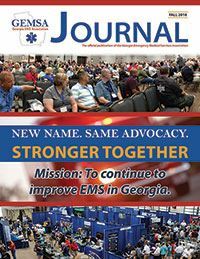 The recently updated GEMSA Journal magazine is published by the Georgia Emergency Medical Services Association (GEMSA) for EMS Professionals across Georgia and beyond. As the EMS industry is always changing and evolving, the association’s goal is to provide a quality publication that educates and connects the EMS community. The GEMSA Journal magazine is published twice a year and distributed to GEMSA members, ambulance services, hospitals, state legislators and more allowing your company or organization to be seen by service directors, technicians, and service providers to name a few. The summer issue features a wrap-up of the GEMSA Directors & Leadership Conference including a list of sponsors and exhibitors along with a preview of the fall GEMSA Providers & Educators Conference. The fall issue features a wrap-up of the GEMSA Providers & Educators Conference including a list of sponsors and exhibitors along with a preview of the Spring GEMSA Directors & Leadership Conference. Whether you are interested in letting Georgia EMS professionals know more about your products or services or if you are interested in submitting an article for publication in the magazine, we have an opportunity for you. See more details below. Ad displayed in a print version of the website and an online version of the publication on the GEMSA website. The more frequently readers see your company name, the more business you will receive from Georgia EMS professionals and EMS agencies! Thanks for your consideration of advertising in our magazine! Do you have a passion for EMS? Do you have knowledge you believe would be helpful to other EMS professionals? Do you want to share your message with EMS professionals across the state of Georgia? Can you share your message through a written article? If so, we want you! We welcome your articles, photos, ideas, and suggestions for our upcoming magazine. Persons interested in writing should be passionate about the subject matter and possess the ability to write knowledgeable articles. If you are interested in writing and have an idea to contribute, please contact Mary Napier, editor at communications@georgiaemsassociation.com or 229-231-2109. Download our submission policy here. Thanks for your consideration of contributing to our magazine!  If you have any questions on advertising or contributions, please contact Mary Napier, editor at communications@georgiaemsassociation.com or 229-231-2109.